The second edition contains updated resources, research institution information and a listing of treatment and care facilities in the United States. 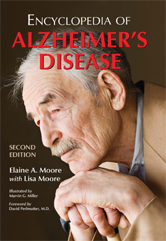 Additions to the encyclopedia section include advances in Alzheimers disease research, genetics, diagnostic procedures, treatment, alternative medicine, brain plasticity, risk factors, clinical trial information, nursing home safety, and preventive measures. In addition the book describes medical treatments used in other countries and the results of collaborative efforts such as the recent global imaging test initiatives and the Prevent Alzheimers Disease by 2020 Project.